What on Earth is Flashmob Shakespeare?! Founded three years by Nancy Linehan Charles, Salty Shakespeare has been performing the famous plays all over L.A. with some major 21st-century swagger. From farmers markets to downtown bus stations to crowded elevators, they’ve been disturbing the peace for 3- to 5-minute scenes before moving on to their next venue. 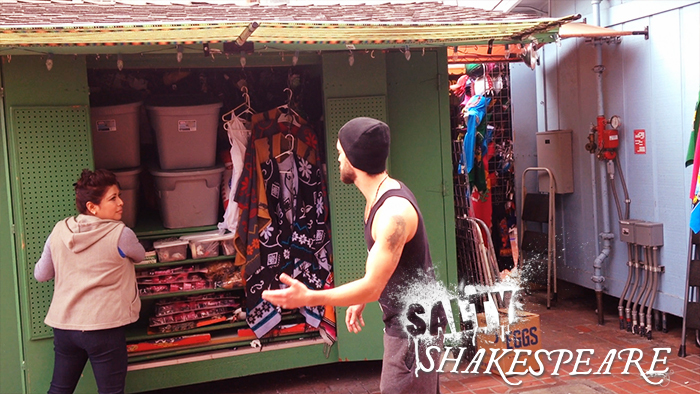 The company’s debut was on the Venice boardwalk (hence the “salty”) but its jurisdiction is unlimited. The group members are wary of asking for permission and believe it’s easier to apologize later. Salty Shakespeare has become popular in institutional circles as well, receiving an Annenberg Foundation grant and getting hired to flash at board meetings, schools, colleges and art galleries. It even has performed at the Broad Stage in Santa Monica while patrons wait to buy tickets for a regular-length Shakespeare production. Performances consist of various scenes from Shakespeare’s plays erupting in public places in the Los Angeles area. Each performance is a scene or series of scenes presented flash-mob style in locations selected to reach a non-traditional audience. 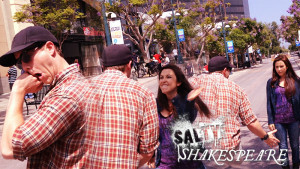 For more info, please visit the Salty Shakespeare website.